ADULT: Wingspan - 55 - 60mm. A delightfully subtle moth of ashy-grey markings on a white background. The smaller male has stunning orange-brown feathered antennae. CHRYSALIS: Black-brown with yellowish hairs located on the ground. LARVA: Green and yellow and hairy with glimpse of black between body segments. 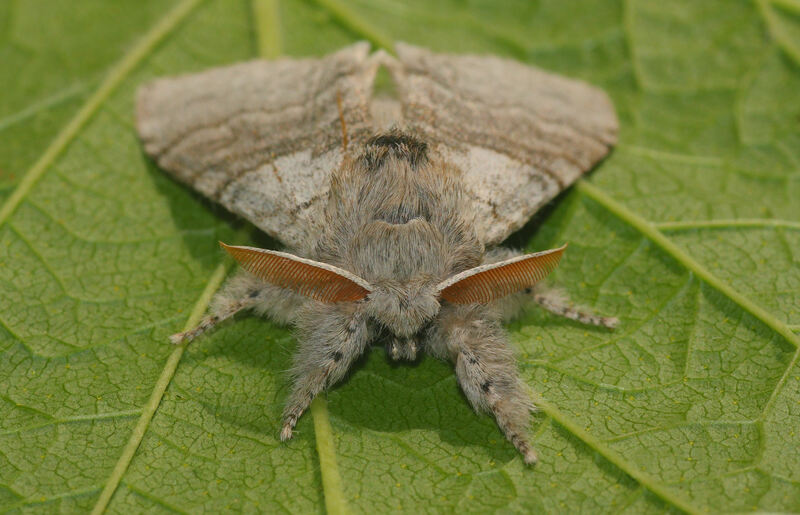 Located feeding on oak, lime and birch leaves. Use to be known as 'Hop Dogs' for their liking of hops. BEHAVIOUR: Attracted to light. HABITAT: Woods, parks and gardens. FLIGHT PERIOD: Single brooded. May - June. STATUS: Resident and common but absent from Scotland.